56 years ago this week, along with the excavation of cave 2, a survey of the cliffs (8 km long, i.e., running 4 km north and south of Wadi Qumran) was carried out under the direction of R. de Vaux of the Ecole Archéologique Française and William Reed, director of the American School of Oriental Research in Jerusalem (now known as the Albright Institute). These were assisted by D. Barthélemy, J. T. Milik, M. Henri de Contenson, all of the Ecole Archéologique Française, and 3 Jordanian assistants. These 8, supervising by 24 Ta‘amireh Bedouin, conducted excavations along the cliffs running 4 kilometers northward from the site of Qumran to Hadjar al-Asba‘* and 4 kilometers southward to Ras Feshkha. Through 230 soundings, 40 sites and caves containing archaeological remains were found and excavated. Each was at first assigned a number connected to the supervisor A-1, A-2 … , B-1, B-2 … etc. Subsequently these caves were renumbered as a group, North to South on the map: Gr. 1 through Gr. 40. Twenty-six of these caves yielded pottery identical to that of cave 1 and Kh. Qumran. Only one cave during this survey yielded new manuscripts, Gr. 8 (later enumerated with the other scroll caves as “Cave 3Q”, numbered according to chronological order in which the scroll caves were discovered). The dig was stopped due to heat (BASOR 135 [Oct. 1954] 8-13; RB 60  540-561; PAM 40.650-656). Excavation: Mar. 10-29, 1952. Final excavation report: de Vaux, DJD III, pp. 3-36. A third system of enumeration has arisen with the cave surveys and excavations of Y. Patrich between 1984 and 1991 for which we will use the numbers PQ1–PQ24. *Hadjar al-Asba‘ is the Arabic equivalent of Hebrew “Even ha-Bohan” of Joshua 15:6, 18:17. The Bible indicates that this was a boundary marker between the territory of the Tribes of Judah and Benjamin. CAVE CLUSTER OF THE NORTHERN CLIFFS: Caves 3Q and 11Q; Survey Caves GQ1–11; Caves A and B; PQ13, PQ24. The northern cliffs lie between the wadi that divides the cliffs two kilometers to the north of Qumran and the Rijm al-Asbah “the rock of the thumb,” about one kilometer further north. CAVE CLUSTER OF THE CENTRAL CLIFFS: Caves 1Q, 2Q and 6Q; Survey Caves GQ12–21. This cluster stretches for one-half kilometer along the cliffs, about one and one-half kilometers to the north of Qumran. GQ22–32, “Christmas Cave”. The caves of the southern cliffs lie along a one-half kilometer stretch south of the Wadi Qumran. 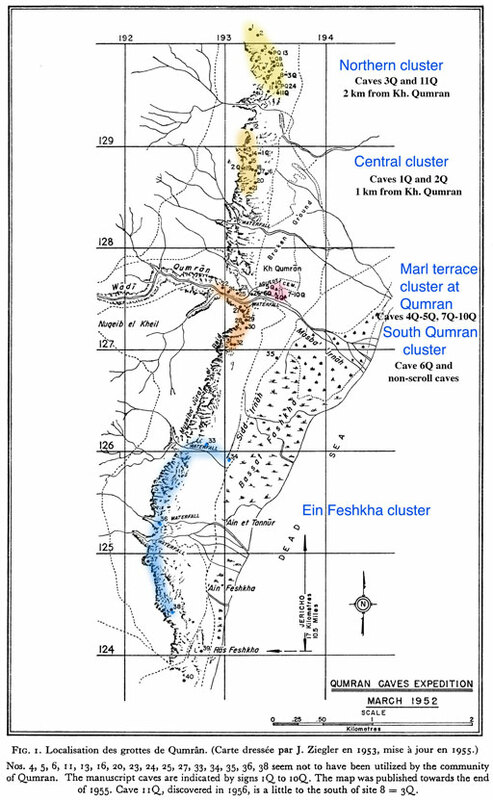 CAVE CLUSTER OF THE EIN FESHKHA CLIFFS: Survey Caves GQ33–40. This stretch of cliffs begins 2.75 kilometers south of Qumran and extends southward for 2.5 kilometers, ending at Ras Feshkha, with the spring of Ein Feshkha at the center. southwest of the buildings of Qumran on a spur of the marl formation separated from the site by a narrow ravine. The Bedouin discovered caves 4Qa and 4Qb simultaneously, with the result that the fragments from the two caves arrived at the museum mixed and indistinguishable according to cave. Thus these adjacent but separate caves were delineated “4Q” by de Vaux with regard to the manuscripts and other items collected by the Bedouin. However, when describing the findings from his own excavations, de Vaux was able to distinguish them as “4Qa” and “4Qb”. SOUTHERN SPUR: Caves 7Q, 8Q and 9Q. The complex is located at the southern end of the same marl terrace, 90 meters directly south of the building complex of Qumran and connected to it by the southern enclosure. The three caves, whose roofs had collapsed, are accessible only from within the confines of the enclosure wall. The caves in the cliffs contained material from the Chalcolithic, Iron II, Hellenistic, Roman, Byzantine and Islamic periods. The most substantial and widespread remains were from the first century CE including the typical cylindrical jars and, less commonly, lamps, cooking pots, tableware and of course the scrolls themselves. Many of the caves were visited on more than one occasion providing remains from more than one period in the same cave. Most periods represented by the remains from the cliff’s caves have counterparts in the stratified remains of Kh Qumran. In certain cases, the date of the remains in the cliffs reflect a time of hiding and transition in the occupancy of the site. Very few however contained scrolls.